The bashful twinkle bunny brought to you by Jellycat is a sparkly funny bunny. Ready to run, jump and shine! 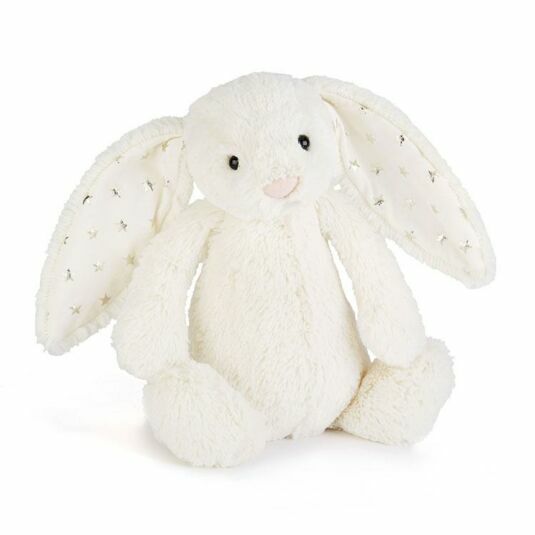 Having wonderfully soft fur, this twinkle bunny is perfect for cuddles and fun! This fluffy bunny is looking for a home and willing companion, to explore but also have tons of fun. She has beautiful soft white fur, bright pink nose, big feet, little arms and a big heart. The best feature is her long droopy ears, on the inside they have a pattern of sparkly golden stars, making them twinkle in the light. A lovely unique cuddly bunny, a perfect gift for a loved one and all ages, great for Christmas and birthdays.